Groundhog Technologies Inc. is now proud to be featured on Mobile LUMAscape as one of the exceptional Data Management companies of 2017. Groundhog Technologies provides a carrier-grade Data Management Platform (DMP) which transforms subscribers’ traffic patterns, online behaviors and transactions, along with other data sources, into further insights for multiple applications. We also partner with leading data companies such as Google, Nielsen, and AppsFlyer to increase the value of subscribers’ data. It has been supporting mobile operators to boost their mobile advertising business and generate very promising revenue since 2016. 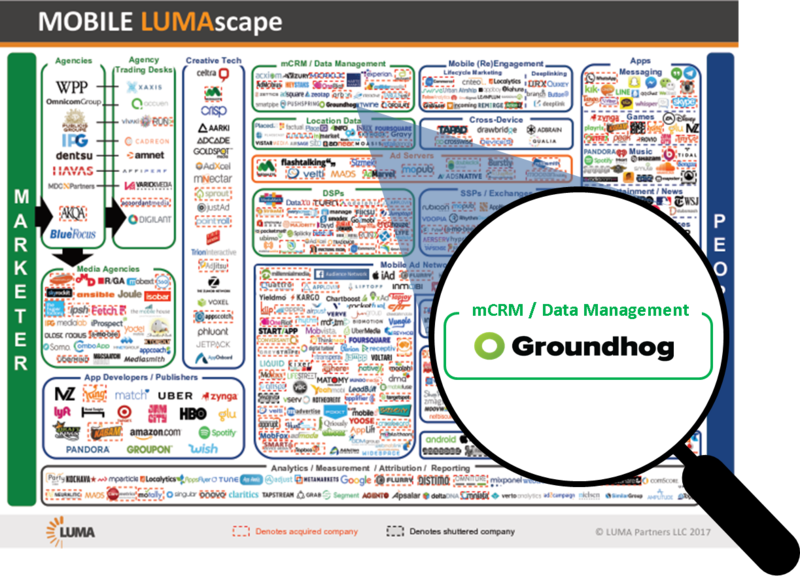 LUMAscape has recognized Groundhog Technologies as one of the leading mCRM/ Data Management Platform tech companies because of its unique capabilities in leveraging telecommunication data in its mobility intelligence solution. Unlike most of the DMP companies that simply aggregate third-party data through acquisition, Groundhog Technologies developed its own proprietary mechanism and algorithms to process multiple data inputs from operators and others. Our continuous investment in R&D has opened up fresh possibilities of data management and enrichment. LUMA Partners painstakingly compiles sector landscapes (“LUMAscapes”) to organize what can be a very confusing ecosystem. They have mapped each of the increasingly overlapping key sectors of digital media, including: Display, Video, Mobile, Marketing Technology, Sales Tech, Content / Native, Search, Social, Commerce, VR and Gaming. According to LUMA Partners, mobile plays an increasingly important connected role in all of these digital channels and its MOBILE LUMAscape maps key player segments in the mobile marketing ecosystem. Click here for the latest MOBILE LUMAscape.